Consciousness came, it was not entirely welcome, but alas, there it was. Upon what was really the last day of our adventure. I dropped the gals off at the Con and sought free parking, found some, approx 2 miles away (no joke, if it had been, the number would have been higher, I assure you.) and strolled over. Whilst I walked I encountered a young couple who inquired if I was attending AwesomeCon, which they explained was a free "Con" being held at the Hilton which was "Tim and Eric Awesome Show" themed. I was wary of them at this point, but they did not display any other signs of retardation so I continued on walking and conversing with them and parted ways about Hall H.
I then made my way into the depths of the dealer hall, the subterranean underbelly of ComicCon, to find my Fiance. Short phone tag later, I located her about 1/8 the way down from the Hall H side of the hall. I followed her for a few rows and finally inquired what her goal was, "to go from one end of the hall to the other!" Ah, so this was to be my punishment before tonight was it? So I reshouldered the backpack and two swag bags she had on her person and began to channel my inner mule, well, mule with a grin, didn't help me much around row 3000, or so, I don't remember. We grumped at each other for a few moments, I went and watched anime for a few minutes, than met T1nk again when she offered me Frank Beddor and bribes. I took them of course and we then headed for the panel situation. Yeah, She takes more/better pics than I do, so see hers there. I hope that I will be able to supply as awesome pic quality (not content, this is me we're talking about) once I acquire a new mobile electronic device. Told Front to break a leg that evening (which he did), donated to Ms. Bredeen's Alcoholic habits, and managed to stalk GeekGirlDiva successfully. For finding this rare spawn, we acquired +1 Rare Shirt ( A Chuck Buy More Supervisor Polo) I'm not a huge fan myself, but I know good swag when I see it. Many thanks to the Lady from EE. ( dont click that EE if you value your savings.) To GGD; may your l00tz be phat, ur dps high, and you're absolutely right, THIS is a diva, not . . this . .
After T1nk got her stalk on, we all met up for dinner. after food, we headed off to The Casbah For AfterCon09!!! FRONT!! LARS!! YT!!! C&H!!! SMBC!!! AND ZEALOUS1!?!?!? SNAP!!! I just nerdgasmed all over myself. It was the shizznizle. They attempted to start with SMBC, but due to technical difficulties . . . .
YTCracker Kicked it off, Lars jumped in on a couple songs with him. YT was good. He was all set, and as he likes to tweet #dothedamthang , which he did. good times. Tech Krew got their gear together and we watched some Cyanide & Happiness shorts, as well as the Saturday Morning Breakfast Cereal shorts. Greatly amusing, nothing that made me pee my pants but definitely funny, and great filler between sets. The Front brutalized the stage along side The Categorical Imperative(his drummer) and his trusty laptop. YT & Lars helped out when needed. 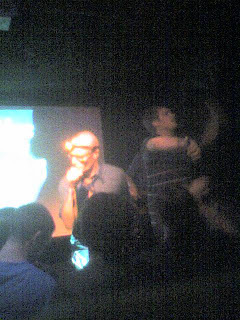 My first time seeing Frontalot Live, but from the other shows I've watched (all of the Nerdcore Rising special features as well as all his site's vids) and he busted it out and laid it down. There was point where he got a lil crazy with his moves, looked like he tweaked his back out, but one "Yellow Lazers" later and he was back to his spastic choreography. Couple more shorts . . .
MC Lars and Co. hit the stage with a vengeance and threw down. He informed us Zealous1 was there, and proceeded to rock the Casbah. (oh yes, I went there) Front helped out with "O.G: Origional Gamer"which part of was composed by Jonathan Coulton (whole lotta geek musician up in these things). After pouring his energy into the audience Lars invited Zealous up on stage to rock a song, as well as two lesser known MC's who laid down some lyrics, kudos to Lars for lettin the little guy bust one out, and after it was obvious Lars was done, T1nk and I had to bounce. We missed Doomtree, and maybe one day I will find them and listen to them, but that day has not yet come, and we we're tired, and I felt guilty bout dragging T1nk along, so I told her we could leave.